CHINA overtook the US at the head of the world of supercomputing today when a survey ranked one of its machines the fastest on the planet. Tianhe-1, meaning Milky Way, achieved a computing speed of 2570 trillion calculations per second, earning it the number one spot in the Top 500 survey of supercomputers. The Jaguar computer at a US government facility in Tennessee, which had held the top spot, was ranked second with a speed of 1750 trillion calculations per second. Tianhe-1 does its warp-speed "thinking" at the National Centre for Supercomputing in the northern port city of Tianjin – using mostly chips designed by US companies. The US still dominates, with more than half of the entries in the Top 500 list, but China now boasts 42 systems in the rankings, putting it ahead of Japan, France, Germany and Britain. It is not the first time that the US has had its digital crown stolen by an Asian upstart. In 2002, Japan made a machine with more power than the top 20 American computers put together. 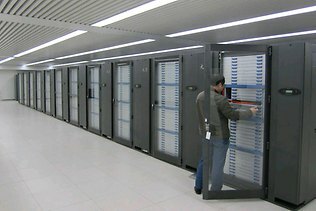 The supercomputers on the Top 500 list, which is produced twice a year, are rated based on speed of performance in a benchmark test by experts from Germany and the US.